Metals are found in just about all soils and rocks and generally form compounds that are labeled “minerals”. Minerals also include the elements oxygen or carbon and need to be purified so that they generate common metals that are more familiar. This process to refine the metals sets up instabilities which also causes corrosion of the metal. Corrosion is the metal’s continuous attempt to regain stability back to the mineral condition. In a certain set of conditions various metals will corrode more quickly than other metals. The system created to rank metals according to their corrosive trends is called the Galvanic Series. The Galvanic Series and rate of corrosion is determined by an electrolyte and the difference in class of the metal. Seawater is often used to calculate how metals will function in real-life conditions because the conditions are fairly accurate with regard to the corrosive actions of metals in other settings such as building construction. In addition to the rate of corrosion, metals are also influenced by chemical reactions on their surface. The chemical reactions may form a protective film around the metal which will change how the corrosion is affected. It is important to understand these protective surface films, their formation in specific metals and how they affect the corrosion of metals as they relate to their use in the construction of a building. Metals are important for building construction, which makes corrosion of metals a necessary consideration when selecting building materials. Aluminum is one of the most common metals in building materials, in spite of its tendency to corrode. It is generally chosen in building materials because it offers low maintenance and has a gradual, slow speed of corrosion. Aluminum’s preferential use in building construction is due to the fact that an exterior protective film called aluminum oxide forms when the popular metal is exposed to the elements. The film of aluminum oxide keeps the aluminum from continuing to corrode in just about any environmental circumstances. While aluminum is often used in building construction, this metal does not usually function well in saltwater situations. Unfortunately, the sodium chloride element in saltwater weakens the protective element in the aluminum oxide film. Because of this in order for aluminum to be used in saltwater settings it is necessary to include other compounds such as magnesium silicide or manganese. Either of these compounds combined with aluminum will create a successful level of resistance to corrosion. In the case of Fabral who uses 3000 series aluminum alloys for flashings and panels, these can be open to the elements in saltwater and industrialized settings because they provide a high level of corrosion resistance. Lead is used less in the present day as a material for building construction, but lead flashings are still used. Lead, similar to aluminum develops a protective film against corrosion. Carbonates, sulfates, and oxides are the usual films common with lead corrosion. They stick to the lead so solidly that they hinder corrosion. When lead is useful for building material it is because of the reaction to sulfur in forming lead sulfate. The lead sulfate is especially useful for building in acid rain or sulfur-laden climates. 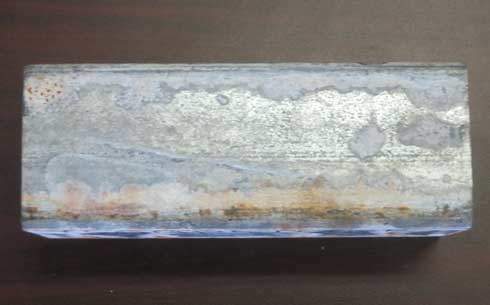 Magnesium silicide or manganese compounds may be used to set up an efficient level of corrosion resistance. Siding, flashings, and roofing are often needed in building materials to resist saltwater corrosion. Copper is often compared to lead when being considered as a building material. Similar characteristics include the high resistance to corrosion when building in surroundings that are full of sulfur. This is often seen in the existence of a sulfate film in the green patina which is thought to indicate aging or aged copper. The patina is a tarnish that forms on the surface of bronze and copper, as well as similar metals. It does provide a layer of protection to an assortment of materials that could become weathered or corroded. Because of the green patina, copper is often thought to be an extremely corrosive metal. The green patina is the effect of a combination of copper sulfates and copper carbonates. The patina in copper weakens and gets smaller, but does not completely do away with corrosion on the basic copper. Galvanized Steel has a zinc coating that provides protection for the metal. The zinc prevents the steel from corroding by preventing the direct surface from exposure. In addition, the zinc and steel combine to form what is called a “galvanic couple” which means the zinc protects the steel for a time from corroding. Galvanized steel that is not painted does not do as well as aluminum, lead, copper or even stainless steel in heavy industrial uses. However, the galvanized zinc coated steel is used successfully in rural, residential and commercial settings. In these locations corrosion is not an issue and the galvanized steel provides an aesthetic attraction. Steel is an alloy which is made from bare iron and carbon. The material is sturdy and durable and has an ability to be used in numerous forms without losing the original composition. That being said, steel also has higher corrosion tendencies than other forms of building materials. In comparison to aluminum, lead, copper and iron, steel forms oxides that are loose and non-adhering. As the oxide flakes off soon after forming, a fresh layer of metal is exposed with an ability to further corrode. As each layer corrodes, the exposed metal becomes weaker. There are ways to prevent corrosion of steel, one being nickel plating. Electroless nickel will resist and prevent many types of corrosion. Cor-Ten is an alloy with a base of steel and copper. It also has chromium, manganese, and nickel. This alloy was developed by US Steel to eliminate the need for painting and other maintenance required in the use of metals as building materials. Also known as “weathering steel” the rust-like appearance will not change even when continually exposed to weather. Due to copper being added to the steel, this building material will cost more than the other material choices. However, also due to the copper, the alloy is especially important for bonding the oxide layer which protects the metal and slows down corrosion. Harsh climates are typically thought of as fog, ice, rain, and snow. However in building construction, severe climates that influence the choosing of building materials include exposure to salt and extreme rain causing the materials to be wet on a regular basis. Because the material is basically man-made there is no shortage of supply.